Hello everyone!!! It's Wednesday and that means we have another Color Throwdown Challenge for you and guess who the hostess is...little old me!!! Don't you just love the inspiration picture...the little fluffy birds are sooo cute!!! I thought you might like some springy colors to get you out of the winter blues. My card features stamps from the adorable Paper Smooches set called Wicked Nauticool. 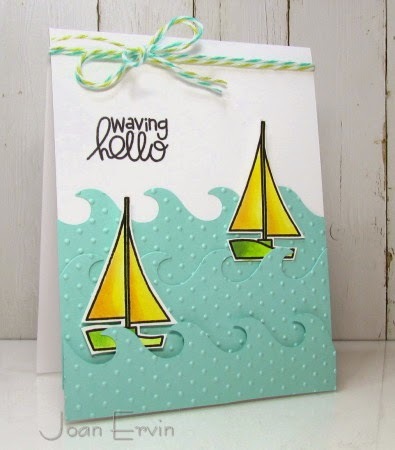 The sail boats were colored with Copics, cutout, and popped up in the waves with pop dots. The waves were cut with a die from The Cat's Pajamas, embossed with a Dotted Swiss embossing folder and adhered to the card base. The sentiment from the same set and the twine finish it off. Remember, you don't have to use the exact colors.....use what you have as long as they are close to the challenge colors and be sure to add CTD286 to the keywords section when you upload your cards to an online gallery so we can find your creations!! cute card.. love those waves..
That is great one layer card!! Love the boats nestled in the waves. Super cute, love the textured waves, very clever! What a super cute card Joan. Love the waves and those sweet boats. The colors work so well with this card. So cute. Love all the waves and the sentiment is perfect for your scene. What a happy card! Like your bright color and the way your boats skip across the waves. Those embossed waves are just super!